We were very grateful to have Xu Xi drop by, amidst her busy schedule, to talk with us in our December session of Kubrick Poetry. It was a meeting that we had long been looking forward to. Xu Xi started by talking about how she was able to keep writing, early in her career, while holding key positions in the corporate business world. She acknowledges the challenge of being a writer in a very commercialized and business-oriented Hong Kong, and so to overcome these challenges and to completely focus on her writing, she moved away. She shared about her experience doing writing retreats in places like Florida and Norway. She also shared her insights in writing about the Chinese experience using the English language, while praising the works of Maxine Hong Kingston as her source of inspiration. Then we came to discuss her new book. Xu Xi read excerpts from the stories “Space” and “Lady Day”. We agreed that the stories in this collection have a tendency to allow readers a lot of space to imagine and to fill in the untold stories implied in the narratives. 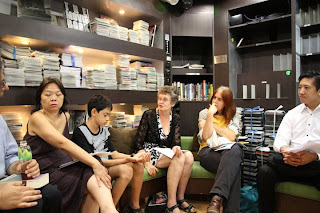 We were also treated to some very vivid accounts of the anecdotes that Xu Xi’s aunt had told her when she was a child, and we learned how those stories have inspired her to write the stories that she writes today. Throughout our conversation, Xu Xi gave us the impression that the writing of this newest book had been a very enjoyable process for her. The audience was also delighted by her ability to narrate her personal experience so animatedly. This kind of liveliness and attention to details are qualities that really shine in her short story collection. Chris Song Zijiang, a native of Guangdong Province, completed a MA degree in Literature at the University of Macau. Published two poetry collections “wiping the dim sky” and “Strolling”. His works has been seen in China, Macau, Hong Kong, America, Australia, the Philippines and Sweden. He is now the acting director of ASM and working in Lingnan University. * You are welcome to bring your work to read and share, in any languages. 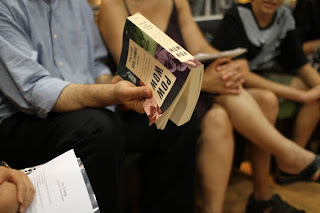 It was another cozy and intellectually-stimulating gathering at Kubrick Poetry thanks to our guest writers Mitch Berman and Susanne Lee, who not only shared their works but also provided us with plenty of insights on what it means to be a writer. Mitch started by sharing his poem “Turning”. It was a very moving piece even though Mitch himself, a fiction writer, very humbly, made no claim to be a poet. He also read the story “The Poorest Boy in Chicago” which, he mentioned, was inspired by the experiences of his grandfather. Susanne shared her work “Vol De Nuit” which is featured in Pow Wow. She read with such a raw and spunky narrative voice that the story felt like a kind of breakthrough from the traditional Asian-American tales. Both Mitch and Susanne provided vivid anecdotes when introducing Ishmael Reed, the editor of Pow Wow. The new anthology features a wide range of voices from various cultures that have all made a mark on American history. Mitch Berman and Susanne Lee, featured in the new fiction anthology Pow Wow, edited by Ishmael Reed with Carla Blank. A comprehensive collection of American short fiction from such authors as Zora Neale Hurston, Chester Himes, Robert Coover, Bharati Mukherjee, Benjamin Franklin, Jimmy Santiago Baca, Ntozake Shange, Mark Twain, Grace Paley, Russell Banks, Langston Hughes, Gertrude Stein and James Alan McPherson. Mitch Berman’s short fiction has been nominated for seven Pushcart Prizes, receiving special mentions from the Pushcarts and Best American Short Stories. He has taught creative writing at the University of Texas and San Jose State University, and his fiction has appeared in TriQuarterly, Antioch Review, Witness, Agni, Southwest Review, Boulevard and Gettsyburg Review. His novel Time Capsule was nominated for the Pulitzer Prize. Susanne Lee has been a film curator, adjunct professor and international business girl who worked in the World Trade Center and was spared by wanderlust. 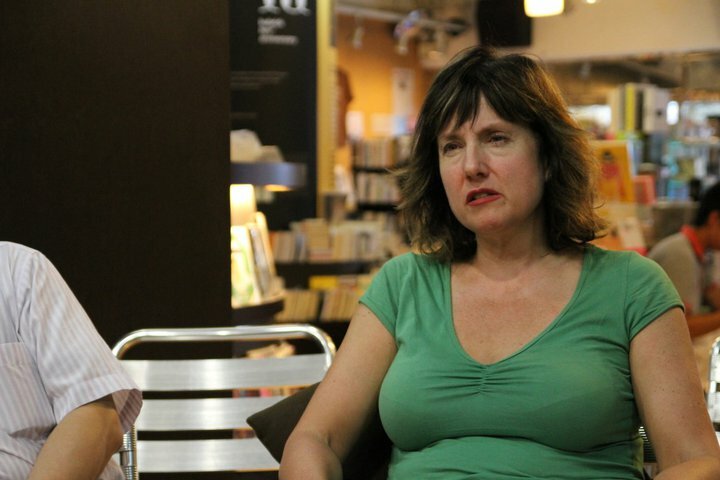 She has published in Giant Robot, the Village Voice, the Nation, the L.A. Times and Asiaweek. Another part of her story in Pow Wow also appeared in the Guardian UK's Orange Openings Contest. A film-maker father. Mother an actress who didn’t want to act – her finest scene a real-life act: dressed to die defying a Nazi officer seeking the paper-less man concealed in the house. The Narrator of Tightrope! ─ A Bohemian Tale, an extraordinary, curiously intellectual small girl, undertakes the demanding and costly burden of comprehending the world. Olga Walló lived for many years in Prague, Czech Republic and now lives in the country-side nearby, She worked for Czech TV for 35 years as a translator and dubbing director and taught dubbing at the Academy of Art. She has translated plays (including 12 by William Shakespeare) and novels. You are welcome to bring your work to read and share, in any languages. 地點 Venue：Yan Chai Hospital No. 2 Secondary School. Arthur Leung was born and raised in Hong Kong. He regularly presents reading of his poetry and has had his poems published in anthologies such as Hong Kong U Writing and Fifty-Fifty, as well as in numerous magazines and journals including Smartish Pace, Yale Anglers’ Journal, Loch Raven Review, Existere, Paper Wasp, Bravado,Taj Mahal Review‏, Poetry Kanto, QLRS, Crannog Literary Magazine, Pulsar Poetry Magazine, Words-Myth, Magma Poetry and elsewhere. Leung has served as external editor for Yuan Yang and as guest poetry editor for Cha. He was a finalist for the 2007 Erskine J. Poetry Prize and a winner of the 2008 Edwin Morgan International Poetry Competition. Akin Jeje was born in the United States of Nigerian and Kenyan parents in the early 1970s. Akin Jeje now lives and works in Hong Kong. Educated in Canada, he is the graduate of four universities: The University of Western Ontario in London, Ontario, Canada (BA Sociology 1994); The University of Calgary (BA English 1996); The University of Guelph in Guelph, Ontario (MA 2001) and York University in Toronto (B. Ed. Primary/Junior, 2005). An active poet and spoken-word performer – in Canada since the early 1990s, and in Hong Kong since 2006 – Jeje's works have been published and featured in both Canada and Hong Kong. His poetry collection, Smoked Pearl: Poems of Hong Kong and Beyond was published on 23 November 2010. The 'Midsummer Enchanted English Poetry Sharing' will be held in the school hall of Yan Chai No. 2 Secondary School. The time will start at 3:50 p.m. to 4: 40 p.m. All are welcomed. If you have any enquiries, please feel free to contact the programme coordinator, Ms. Polly Ho from Kubrick Poetry and Ms. Caroline Fung, from Yan Chai Hospital No. 2 Secondary School. Thaddeus Rutkowski grew up in central Pennsylvania and is a graduate of Cornell University and The Johns Hopkins University. He is the author of three novels, Haywire, Tetched and Roughhouse. Both Tetched and Roughhouse were finalists for an Asian American Literary Award. He teaches literature at City University of New York and fiction writing at the Writer’s Voice of the West Side YMCA and serves as fiction editor for the literary magazine Many Mountains Moving. A master of both flash fiction and slam poetry, Rutkowski is a two-time winner of the Poetry Versus Comedy slam at the Bowery Poetry Club and a one-time winner of the Syracuse Poetry Slam and the Nuyorican Poets Cafe Friday slam. * The reading is part of Plug-In-Yourself on Friday night. Following a sunset poetry reading organised by a local literary group called the Kubrick Poetry Club, a member of the audience asked me what poetry meant to me. 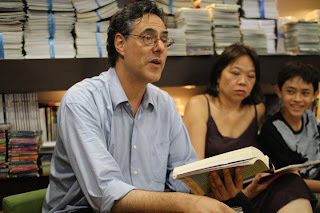 I had been reading from my recent collection Ban Cun Zai (A Half-Existence) at a bookstore in Yau Ma Tei, and in reply I said, “It is part of my life”. Perhaps my reply was too dull and unexciting, and didn’t satisfy the audience’s expectations. But I thought it aptly described how my pulse beat and my blood flowed when I replied to the question. Although physically indoors, standing between the spotlight and microphone, I could sense a spring breeze gently blowing to bring forth leaves so green that they could not be greener as I seemed to see the ever-changing sunlight radiating through the twigs and branches. I could never relinquish this “part”, expressed as part and parcel in English, something which is important and essential, just as I could not ever give up academic research, which is part of my life, too. I bumped into a colleague after I bought a coffee following my meal, and was heading back to my office in the To Yuen Building. We exchanged greetings and then said our goodbyes, and I returned to my usual footsteps. Such an encounter is also part (and parcel) of life. This “part” gently breathes in an existence where time slips, like grains of sand through one’s fingers, exhaling unnecessary exaggerations and inhaling a soothing sense of calm. Unconscious consciousness—if I may use an oxymoron—can be felt to be as fine as a single droplet of water clinging to the eaves of a house or as vast as deep rivers and expansive oceans. Night falls. My kitten leaps onto my lap, curling up to sleep. The only sound is that of my fingers tapping at the keyboard. “I am a part of poetry,” I write. Special thanks to Linkage from City University for the English version. Jason S Polley has an interesting background. He allocates his time to reading, scuba diving, practicing yoga, and getting tattooed. 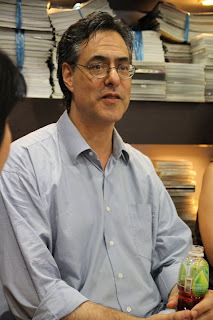 He currently teaches American Literature and Culture at Hong Kong Baptist University. refrain is a poetry collection of Jason Polley’s adventure into India as a religious study major back to 1997. A young man arrives in Delhi with a romanticized view of India, a pocketful of outdated maps, and a money belt begging to be stolen. The stories work as a sprawling dramatic monologue. Polley paintes on a large canvas and his brush stroke are fresh, memorable and cutting edge. There is a magic on this book that is “It keeps on begining”. We would like to thank all of you for submitting your poems. We are in the process of reading and appreciating your works. The choice for the wood print complement will be announced at a later time. However, for our February gathering, we would like to invite all of you to come and read your submitted poems. Bring friends. It will be a great time for sharing. New works and new participants are welcome too, of course.